16 oz. 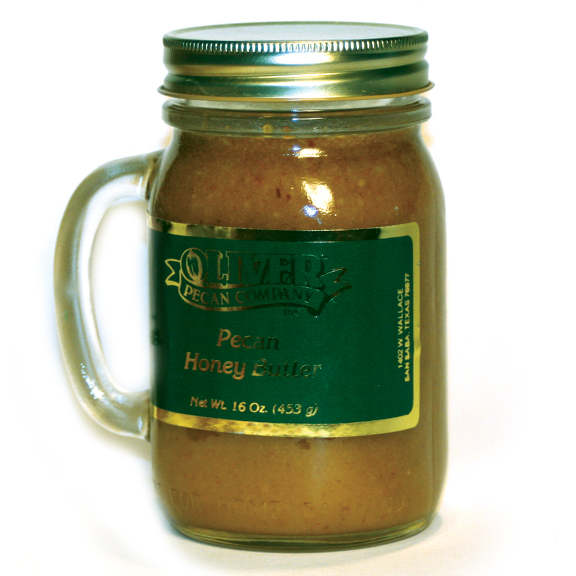 Mug Jar Pecan Honey Butter, Pecan Honey Butters: Oliver Pecan Co.
Our famous honey butter is made with only the finest Texas ingredients. Enjoy on homemade biscuits, toast, English muffins, oatmeal, pancakes, waffles, ice cream, sweet potatoes and cooked carrots. You can even use it as a frosting for German chocolate cake. Enjoy the mug after you empty the jar, which won't take long. Flavors include, Pecan, Amaretto Pecan, Maple Pecan, Praline Pecan, Toffee Pecan, Orange Pecan, Banana Nut, Peach Pecan, Apple Spice, Sea Salt Caramel Pecan, Pumpkin Pecan and Chocolate Pecan. There is also Cinnamon which does not have any pecans. The creamy goodness and hint of amaretto is so addicting you will need to buy it by the case!